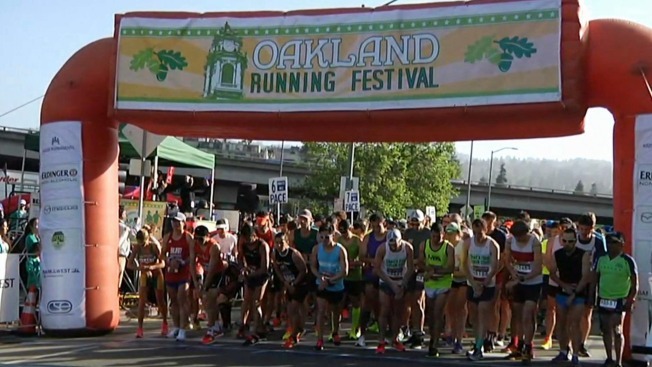 Bay Area runners grabbed the top spots on the podium Sunday morning following the premier races of the Oakland Running Festival. Oakland's Semereab Gebrekidan, 32, finished the men's marathon race in first place with a time of 2:35.56. Berkeley's Katherine Klymko, 28, was the top finisher on the woman's side with a final time of 3:09.06. Aside from the marathons, 5K races and relays were also offered. Justin Jayme, a former runner at Saint Mary's College in Moraga, was a big fan of his 5K competition. "It was a good race," he said. "Very well set up." Jennifer Bartholomew and her running partners noted that the folks in their race were a pleasure to be around. "Great people, great vibe," Bartholomew said. "It was fun."